Comfortable, classy, spacious home now booking for the 2020 season. Located at the base of the San Tan Mountains, this home is stocked with most everything you will need for your vacation in sunny Arizona. The spacious living areas include separate living and family rooms and 10 foot ceilings add to the spacious feeling in every room. The split floor plan includes four bedrooms, each have new, quality mattresses: one king, two queens and a set of twin beds, sleeps 8 comfortably. All beds have high quality bedding with a spare set for each bed. The Master Bedroom suite features a King size bed and includes a large seating area with comfortable oversized chairs and ottomans to relax and enjoy quiet time or watch your favorite movie on the new 42' flat screen TV. The room also features a full wall of windows to allow for natural light and a door to the backyard patio. The huge master bath includes separate shower and tub with expansive walk in closet!! The open kitchen features granite, stainless steel appliances and all the utensils needed for cooking and entertaining your guests. An ample supply of dishes and glassware allows you to serve plenty of guests. A dining table will expand to seat 8 with additional seating at the counter allows room for 3 more. We just replaced the dishwasher with a new Bosch. You will be impressed with how quiet it runs!! The family room has HDTV with cable, a large comfortable sectional and a three panel glass patio door unit expanding the full length of the room to provide natural light and view of back yard patio. The patio door has a special locking safety feature which will prevent young children from accessing the pool area without an adult. The Living room has a comfortable conversation space for lively discussions or quiet time. A collection of books and games is a work in progress. If you have young children, there is a nice selection of children's books to read. The laundry room includes a Samsung high capacity washing machine and a front load dryer to ensure you won't waste any vacation time at the laundry mat. A utility sink for stain treatment and a counter makes doing laundry convenient. Laundry soap is available as well as several cleaning supplies if needed. Our outdoor patio extends the cooking space with a built in Beef Eater BBQ grill and counter which all can gather around to provide expert advice to your BBQ chef! Store your beverages in the outside fridge to cut down trips into the house. If the cool Arizona evenings give you a chill, warm up by the backyard gas fireplace. The beautiful pebble tech pool has step down entry, lighting for midnight dips and the outside shower allows you to rinse after your refreshing swim. A pool heater has been installed for your winter swimming pleasure. Quiet, friendly, safe neighborhood adds to your relaxation. Enjoy the sun in the front landscaped yard and meet the neighbors Located just 15 minutes from Mesa Gateway airport. Area is close to shopping, variety of dining options, golf, hiking, walking, biking trails, parks for families. So much to do and see in the area which will make for a great vacation. We are not yet ready to retire but want to have a place to go to 'get away' to the warm sun when the Minnesota Winters get to us. We grew up in Minnesota and North Dakota but fell in love with Arizona on our first trip there. It is so different from where we currently live that we know we are on vacation when there. We love this home. It is spacious yet comfortable for accommodating company. The house can accommodate special activities, holiday dinners with family and friends. The entertaining can easily transition to the back yard with the pool, fireplace and built in barbeque. The only thing we could add would be a fruit tree (or two!!) And if there is no other reason, the weather in Arizona is the best to get away from our Minnesota winters. If you like to be close to the city but have the feel of a rural area, this is for you. Our home is located on the southern edge of the city area with many areas undeveloped. At the base of the San Tan Mountains. San Tan Regional Park is within 10 minutes. There are several hiking trails in this park. Also can horseback ride and mountain bike on trails. Central air conditioning and ceiling fans in all rooms. Two thermostats which control heat and air in different regions of the home. Bedrooms are separate from main rooms. High quality sheets on all beds. Spare sets for each bed. Several blankets to wrap up in while watching TV or movies. High capacity Samsung washing machine. Counter in laundry room for folding. Also sink in laundry for stain prep or rinsing. Gas dryer on drawer pedestal . Nice, clean Two car garage, but recommend one car in the garage. Two living areas - one when you enter the home features comfy leather couch and chairs. Second is family room with comfy, large sectional. Stainless steel side by side. Ice and filtered water dispenser on front. Recently added a beverage fridge on outdoor patio to keep your pool beverages cool! Electric, Cooktop, storage drawer below. Stainless steel with convection oven and electric cooktop. Self Cleaning. Variety of spices for your use. Various pantry items may be available and may include a bottle of wine or a couple of cold beers. Please help yourself but consider paying it forward. 3 sets of Dishes each setting for 8+, cups, and utensils for 8+. (One set for outdoor eating) Variety of glassware to accommodate various libations and guests. Kitchen dining for 8, outdoor seating for 4-6 Also stools to sit at kitchen counter. Can bring outside to sit around BBQ counter. 200+ channels thru Direct TV Cable may not be available May thru September. If not available, you can request to have it connected during your stay for an additional fee. Contact the owner. Blue ray Red box rental is available at Walmart just down the road. Variety of titles, also childrens books. If you start a book but don't finish it before leaving, feel free to take it with. Consider leaving another behind! Music channels are available on cable networks. We are working on developing our video library. We frequently add to it. Covered patio with additional seating and ceiling fan, chair pads stored inside Master bedroom door room. Bench seating along both sides of the fireplace. Lounge chairs for sunning. Johnson Ranch 2 miles from home. Variety of courses within 15 minutes. All one level for easy access to all rooms in the home. Four inch rise to get into home. Beautiful pebble tech pool with lighting for evening swims. Outdoor shower for convenient rinsing off after your swim. A pool heater was added in 2014 to extend the swimming season. Local highlights include the Queen Creek Olive Mill (delicious food and gifts), Schnepf Farms with great activities for kids (and adults) and various restuarants including the popular San Tan Flats Steakhouse. Medical services close by as well as a variety of shopping options. Visit the Chandler Fashion Center, day trips to Sedona, Scottsdale and Prescott. Numerous Baseball Spring Training Camps to enjoy. Over 200 Phoenix area golf courses, 25 in the East Valley with 20 minutes. Located at the base of the San Tan Mountains, lots of hiking and biking trails. Community park with playground within walking distance. We had a very nice trip to Queen Creek. The home is comfortable and well maintained. The backyard fireplace, grill and pool made the backyard experience enjoyable. All the photos and descriptions on the site are accurate and up to date. We have nothing but good things to say about this home. 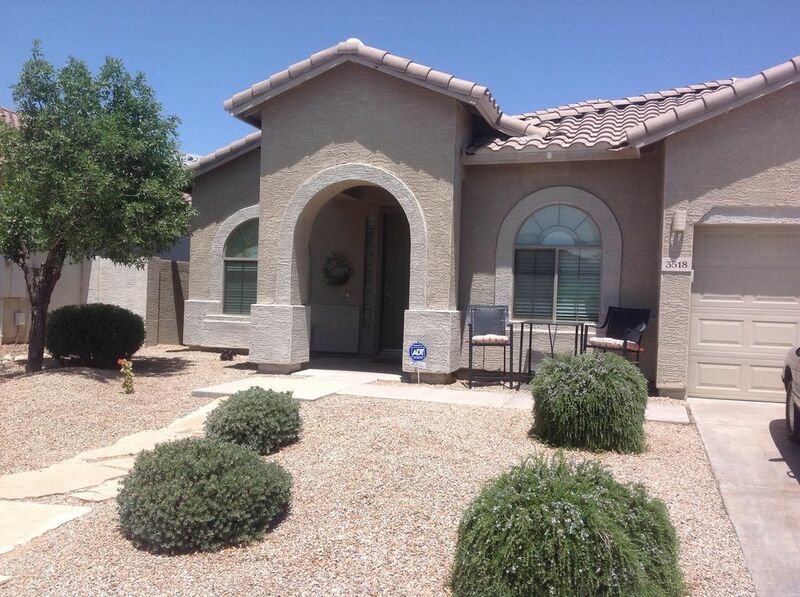 We rented it for the month of March and loved the home and the surrounding area close to the San Tan mountains. The home was very well stocked with kitchen utensils, dishes, glasses, pot/pans and silverware. Furniture and decor were comfortable and tasteful. Pool/patio area is where we spent most of our time and had a great time. Its close to shopping, hiking and golfing. Homeowners were very responsive when we had questions. We would recommend this home to anyone. Super home in San Tan Heights. All you want is close by. Pool was a great addition! Close to Walmart and Fry's. Golf is very close. Just a great vacation! We are so glad you had a great vacation and were able to enjoy the amenities of our home while in Arizona. We strive to ensure everyone that stays in our home has what is needed for a comfortable vacation. Thank you for choosing us!! Very enjoyable stay, great location! We enjoyed our week at this San Tan Valley home. The house had everything we needed. We got a lot of use out of the pool and fireplace. We had a little trouble with the ice maker and outdoor fridge not working but overall it didn’t affect our stay. Excellent week! We are so glad you enjoyed your stay. I’m sorry about the ice maker and outdoor fridge. I wonder if the ice maker was turned on and the fridge plugged in. We turn the ice maker off when guests are not there so ice doesn’t become stale and unplug the outdoor fridge so it won’t short out. I encourage guests to call if there are any tissues so I can address them during your stay. I am happy you got great use of the pool and fireplace. Arizona is great this time of the year - great to spend time outside!!! Great house and pool. Nicer even than the pictures. Owner was amazing to contact and very flexible. Would highly recommend this property. We needed nothing, wanted for nothing. Anything we forgot to bring was there for our pleasure. Cooking inside or outside on the grill, everything came out perfect. The heated pool was a home run for my Great Grandchildren and their parents. Future rentals will be highly probable. Will accept payments through HomeAway, checks or cashier checks. Pool heat is included in the rental price. Damage deposit will be returned after house has been checked and may take up to 30 days to be returned. The full amount (minus electronic payment fees if they apply) will be returned as long as things are found the way they were left and utilities are not excessively used.